Last weekend a number of club members were in Lisbon, Portugal for the 38th European Wadokai Karate Championships. 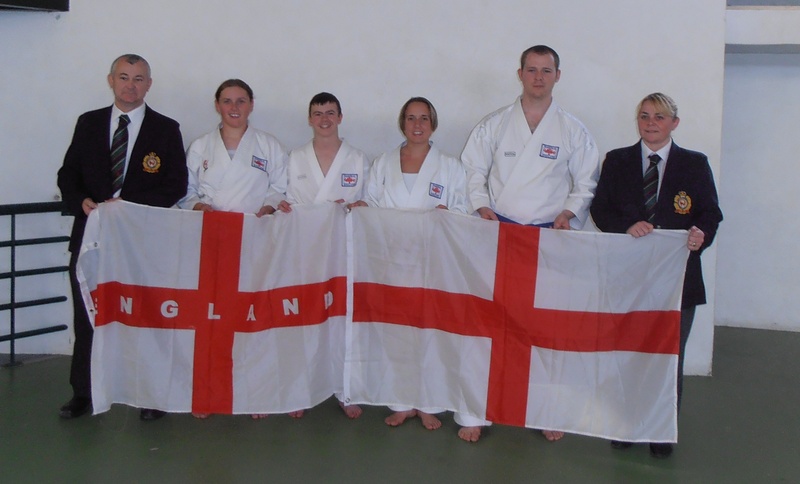 They were selected as part of the 50 strong Wadokai England Karate Team. 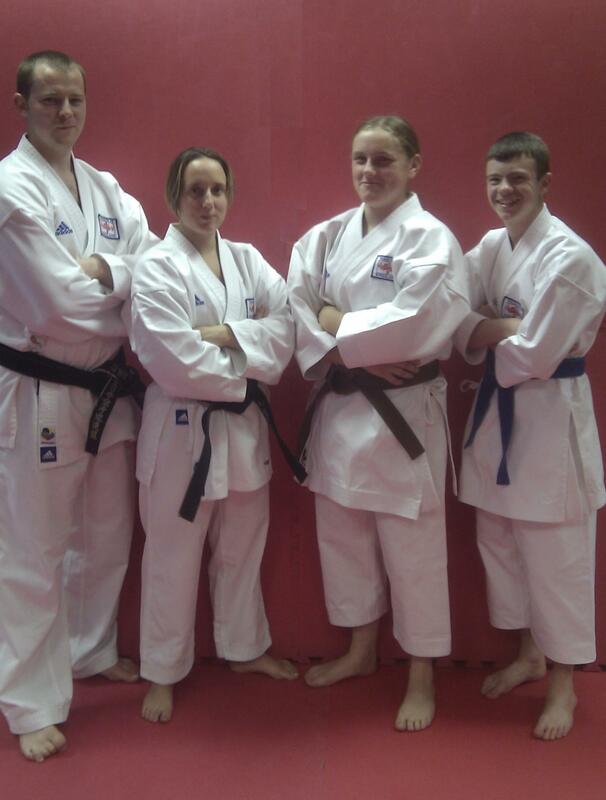 The Hartlepool competitors were Carl Jorgeson, Amy Jorgeson, Jasmin Langley & Bailey Reed. They were supported by Sensei Lynne Jorgeson & Sensei Michael Jorgeson who were both Refereeing & Judging at the event and also a number of parents. The entire England Team performed very well and brought back over 60 medals in all (awaiting exact medal count), the four Hartlepool Wadokai competitors brought back an impressive 14 medals between them. They were 7 GOLD, 2 SILVER, 5 BRONZE. Us coaches believed that Bailey & Jasmin both had the potential to medal at the event, despite this being their first ever European Championships (or they wouldn’t have been selected) but we were obviously very pleased with the actual results. Both competitors were tasked to train 15-20 hours a week for the past 6 months in preparation, then weekend training camps and competitions on top so they definitely deserve their massive medal haul. On a personal note, I’d like to thank all of the club members who helped raise funds for the event and also to the other club members who formed an integral part of the athlete support network by keeping the four of us motivated, pushed us that little bit further and gave us a beating when we were too slow in fight training! I’d also like to thank the Sports Coaching staff at Hartlepool College of Further Education for their training advice and the use of their world class Cryospa which all helped to get us older competitors fit for the event. Not wanting to take this result for granted, we’ve already started planning for next year’s European Championships which are looking to be held in Italy (Rome or Venice). Over the coming months we’ll be pre-selecting potential Hartlepool Wadokai students who can then try for the Wadokai England Team. If you would like to be considered for the squad next year then you should speak to Carl or Amy as soon as possible. Today and Tomorrow morning sees members of Hartlepool Wadokai heading to Lisbon, Portugal to take part in the Wadokai European Karate Championships as part of the Wadokai England Karate Team. Veteran’s Carl, and Amy will be joined by squad newcomers Bailey Reed and Jasmin Langley. The team of four will be joined by Lynne and Michael, both judges at the event and a bunch of parents who will be cheering everyone on. The four Hartlepool competitors have each been selected for every possible category they could have, those are: Individual Kata, Individual Kumite, Team Kata, Team Kumite so it’s going to be a very tough and very busy weekend but they will all no doubt do there very best. We’ll try to keep everyone updated (it depends on the internet connection in Portugal) in some way, either through the club social network (Facebook, Twitter, this blog), or by good old fashioned telephone.